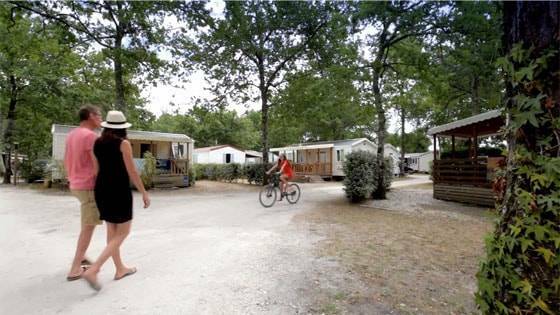 A pleasant climate, beaches and vineyards stretching as far as the eye can see - everything you need to spend unforgettable holidays in Gironde beside Arcachon Bay in our 4-star campsite La Canadienne! Make the most of your stay to explore the 1001 faces of Gironde: its unspoilt coastline, pine forests, lakes, cycling trails beside the sea, and the famous Arcachon Bay, an inland sea bordered by the highest dune in Europe, the Dune du Pilat! And not forgetting, of course, its world-renowned vineyards and exceptional heritage to be explored on foot, by bike, on horseback, by boat or in a canoe. A trip to Bordeaux, a city listed as a UNESCO World Heritage site, is a chance to discover an unmatched historic, cultural and festive heritage. And for the most energetic visitors, Gironde also has its fair share of sensations with international surfing competitions in Lacanau, horse-riding, hiking and cycling.